What first that comes to mind when scenting Poudre de Riz is dulce de leche, condensed milk turned into a kind of caramel, very sweet and popular in South America. Poudre de Riz has some sweet notes which remind me of almond as well. For me it is hard to distinguish the separate top and middle notes as they are very well blended. More important is the feeling it gives: lush, overwelmingly sweet, luxurious, and warm. The drydown is surprisingly warm and resinous probably due to the benzoin. In some seconds I felt like the lady above on the painting. Poudre de Riz would suit a lady wearing a fur stola in the concert hall leaving a trail of her perfume when she leaves the foyer/lobby. A concert hall like the Concert Gebouw in Amsterdam with red carpets and velvet chairs. She would have had to spray a lot of perfume as Poudre de Riz stays quite close to the skin. But it is a perfume with a modern twist to it. The modern twist being the monoi and slight but very well blended coconut. The Concert Gebouw in Amsterdam has a new wing build next to the building as well, its modern twist. Poudre de Riz was inspired by a phrase in the novel The inferno (1908) by Henri Barbusse, “The air in the closed room was heavy with a mixture of odours, soap, face powder, the pungeant scent of cologne.” When reading this sentence one would think a suffocating heavy powdery perfume was created. This is not the case. Poudre de Riz does not remind me of soap or the pungeant scent of cologne at all. Sometimes it is better not to know anything about the inspiration for a perfume and just scent it, like it is. Notes according to luckyscent: damask rose, tiare absolute, coconut, vanilla, rice powder accord (caramelic, burnt toast and maple notes), sandalwood, iris, cedar, tonka bean, tolu balsam and benzoin resin. Poudre de Riz was created by French perfumer Pierre Guillaume for Huitième Art Parfums. Huitième Art Parfums was founded in 2010 for the 8th anniversary of the perfume house Parfumerie Generale. The name Huitième Art means eighth art. According to perfume critic Octafian Coifan perfume is the eight art next to painting, music, architecture, dance, poetry, sculpture and architecture. Poudre de Riz means rice powder and was used by women as make up powder like the red box on the painting, to whiten ones face. I came across a painting in the Van Gogh Museum named Poudre de Riz, the woman on the painting is the opposite to the lady in the first painting and the feeling it evokes. 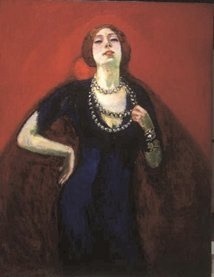 The lady on the second painting is probably Suzanna Valadon, mistress to Henri de Toulouse- Lautrec. 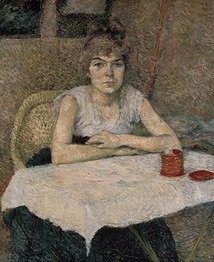 She does not look not luxurious, lush, warm or sweet no surprise if she really was the mistress of Henri de Toulouse-Lautrec. Poudre de Riz is not a very original perfume, but very well blended and nice to wear for example for Christmas or coming Autumn. But not a scent I would buy, quite frankly, as it is a bit too sweet for my taste. But if you like your perfumes quite sweet, give it a try ! Do you like sweet fragrances ? If so, which are your favorites ? If not, which are really too sweet for you ?